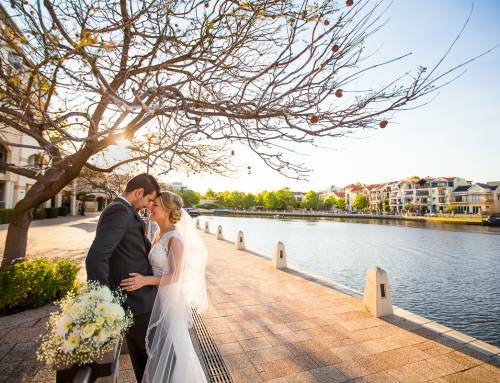 Famous for its variety of plants, trees, and flowers, and its breathtaking panoramic view of the Perth city, Kings Park is one of the top location choices for weddings in Perth. 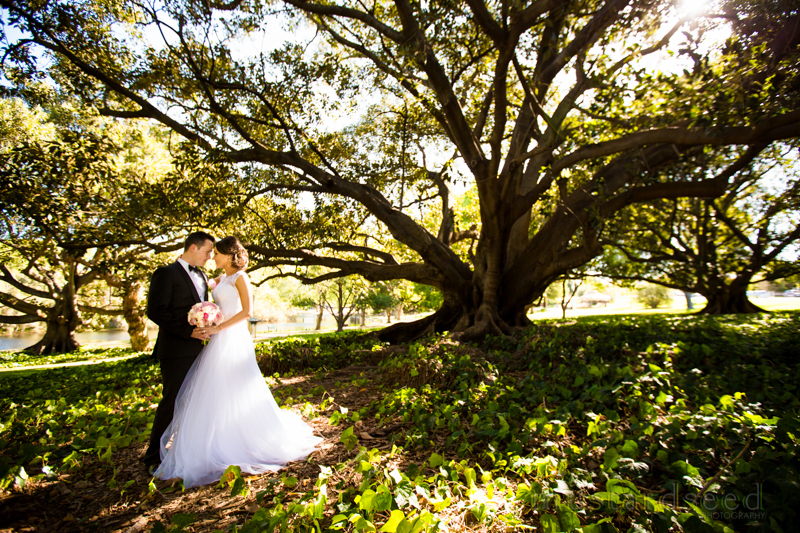 With an abundance of trees at Kings Park, I can get creative with what I use for my foreground and background. 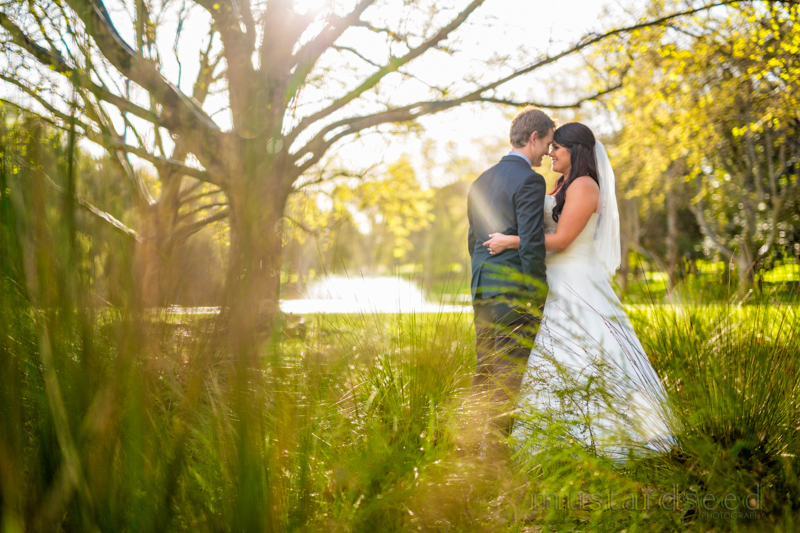 Here, I used the bush in front the and trees at the back, illuminated by beautiful golden sunlight to create this stunning photo of Jess and Gerard. One of the hidden bush tracks in Kings Park, Aleisha and Eddie picked this place, and it was a hidden gem which I’m thankful I discovered! Who knew that this rotunda would look this awesome at night! 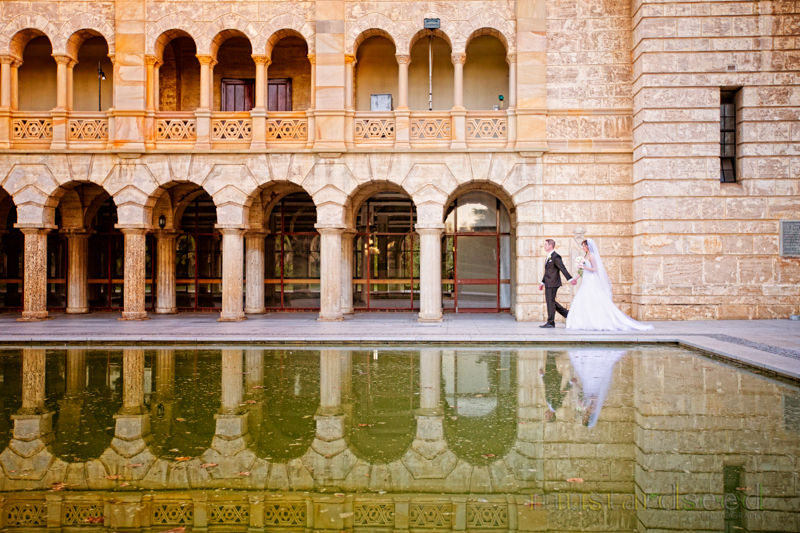 Loving their reflection on the water! 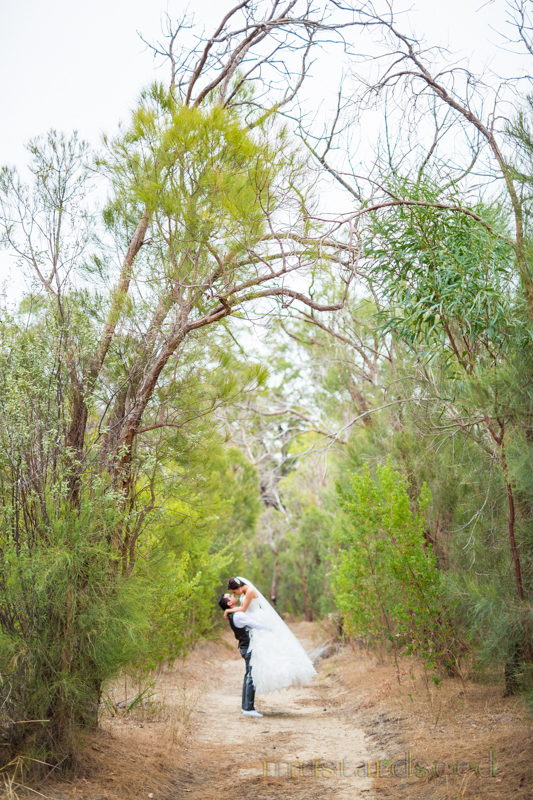 The tall trees bending down as if to watch the Aleisha and Eddie dance! Amazing golden light coming through the trees! 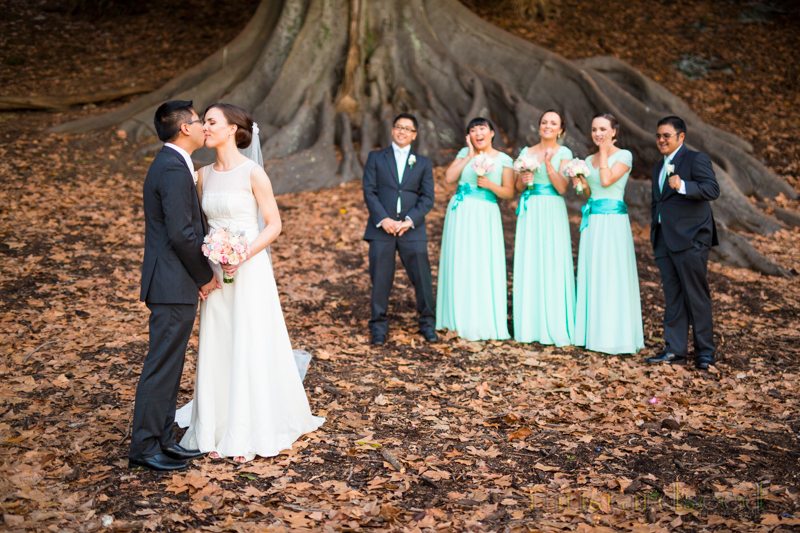 I love the contrast of the greenery and Kim and Ben’s brightly-coloured attires which made them stand out! Whenever I see artistic structures like this, my mind goes “Sweeeet! Now how do I make this into a photo?” Roxy and Subhan were willing to go along with my experiment the resulting photo is Sweeeet and one of a kind! John Oldham Park’s beautiful wooden trellis. 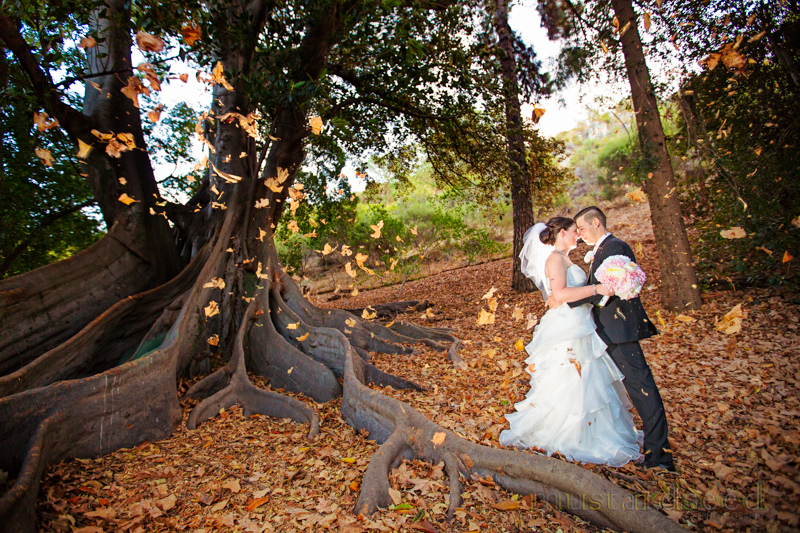 The bridal party had an awesome idea to throw dried leaves on Sarah and Barry, and it turned out to be one of my all-time favourite photos! 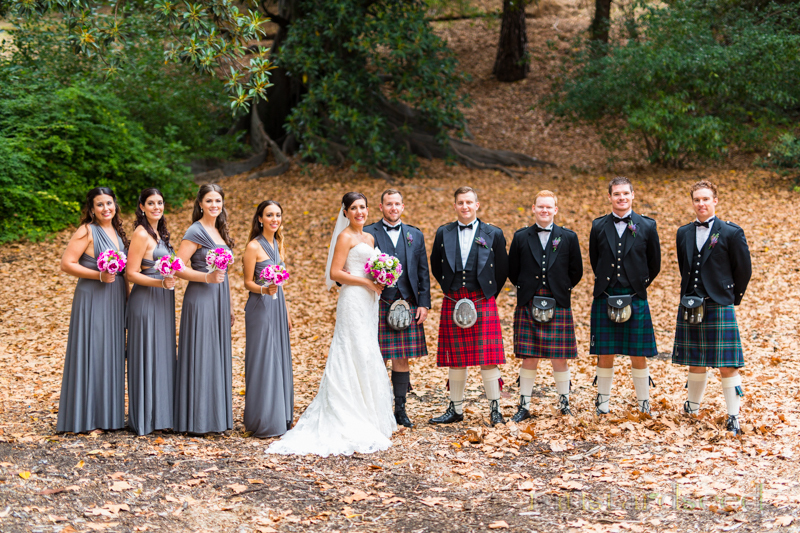 Julia and Richard’s beautiful bridesmaids and handsome groomsmen. 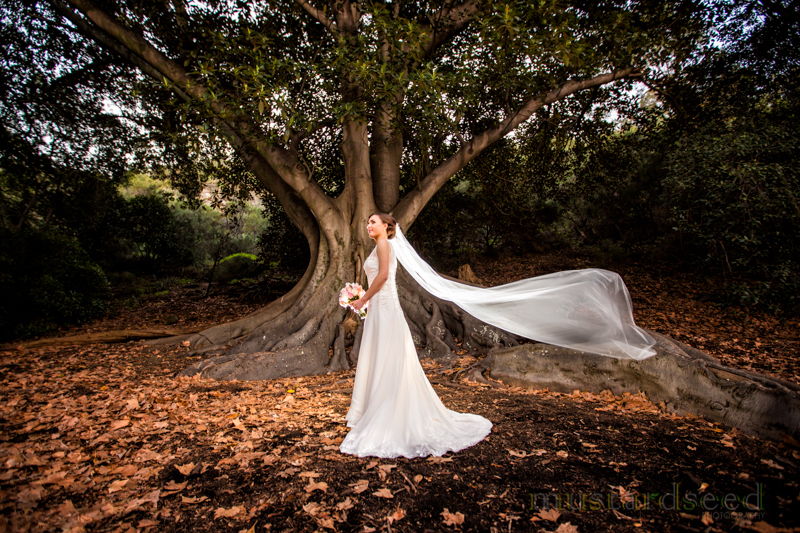 Megan and her beautiful long veil. 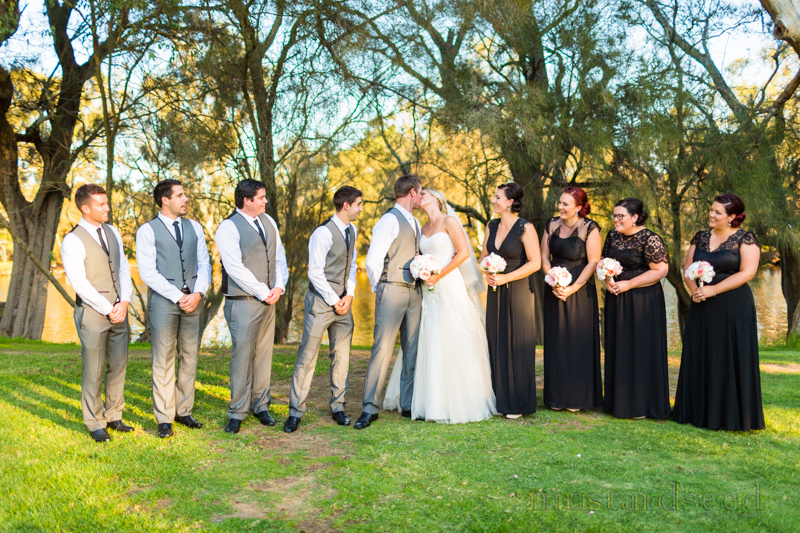 Megan and Richmond showing off a public display of affection, getting mixed reactions from their bridal party! 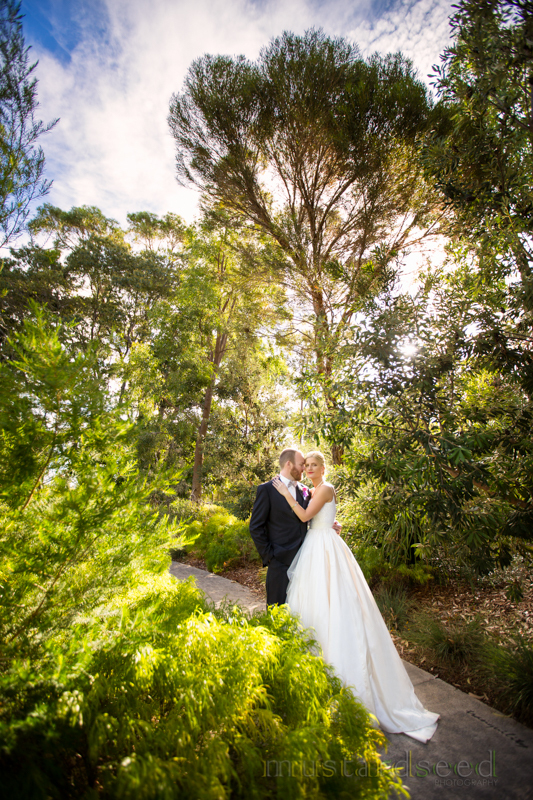 I love how these giant trees that form an arch on this pathway framing John and Denisa in the middle. 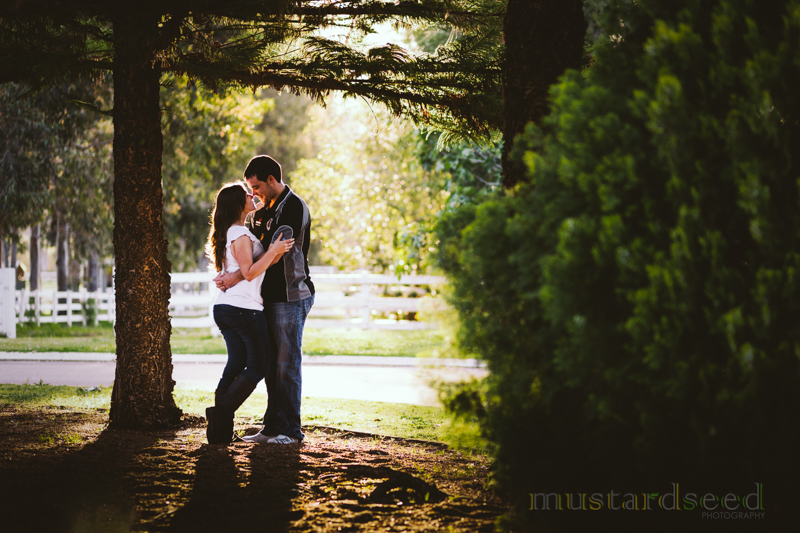 John and Denisa just loves Hyde Park. 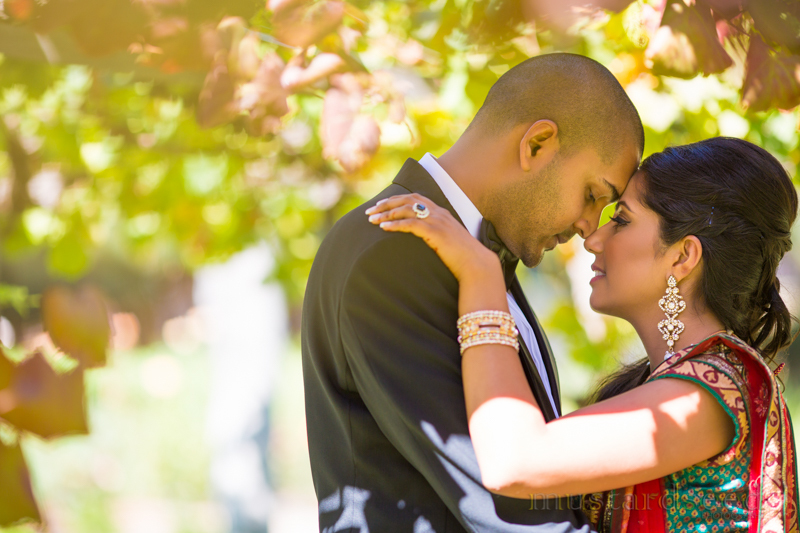 They had their pre-wedding and wedding shoot in the same place, and I couldn’t blame them! 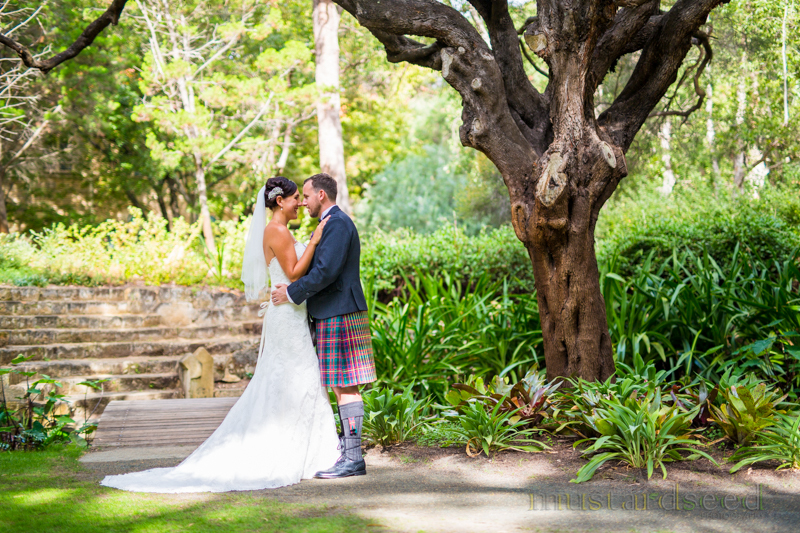 Hyde Park is one of the most beautiful parks in Perth! 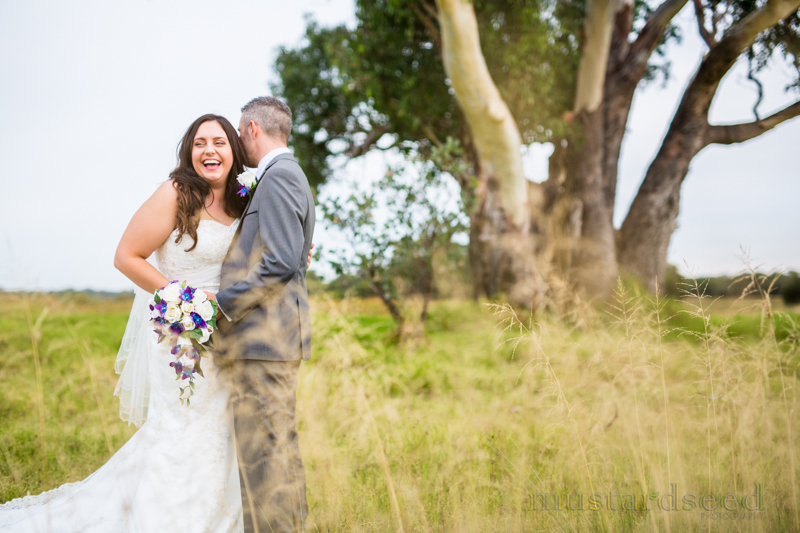 I often shoot in paparazzi mode, ducking and hiding behind the weeds, to get interesting shots like this one of Jess and Gerard. 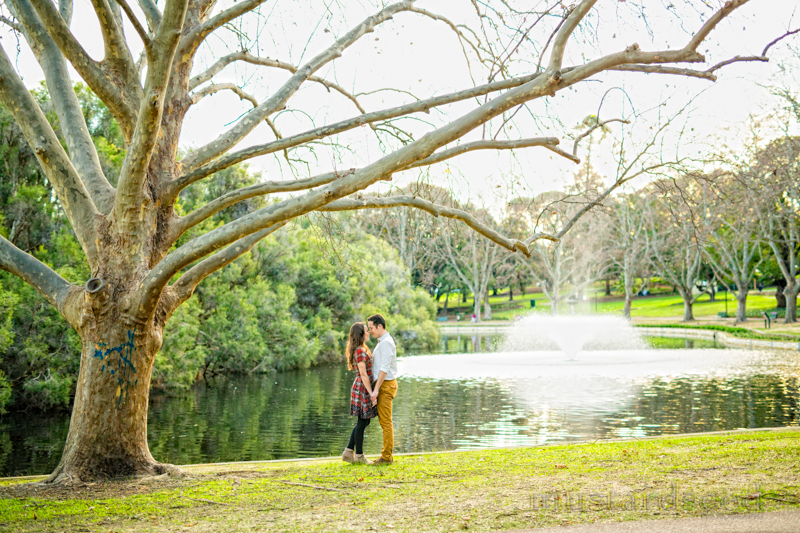 Hyde Park looks different during different seasons, time your pre-wedding shoot depending on the look you want. In this photo taken during fall/autumn, the trees have shed most of their leaves. 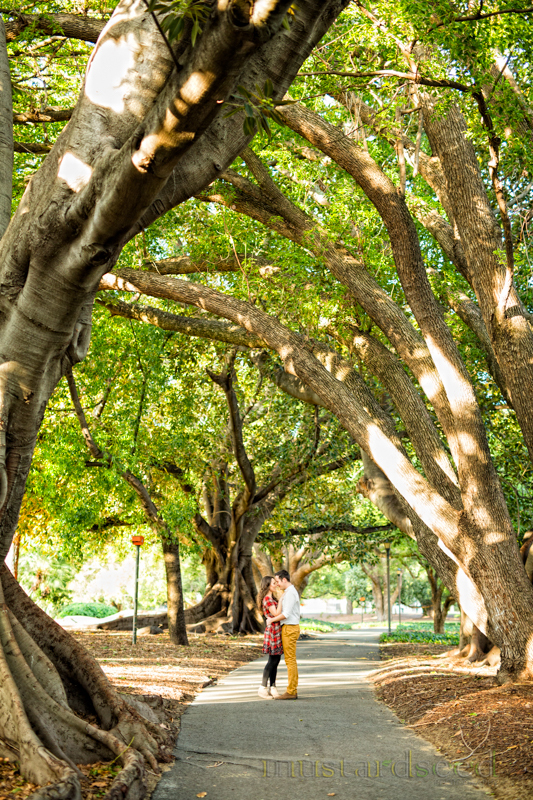 The row of giant trees that curve around Hyde Park is one of its most appealing characteristics. 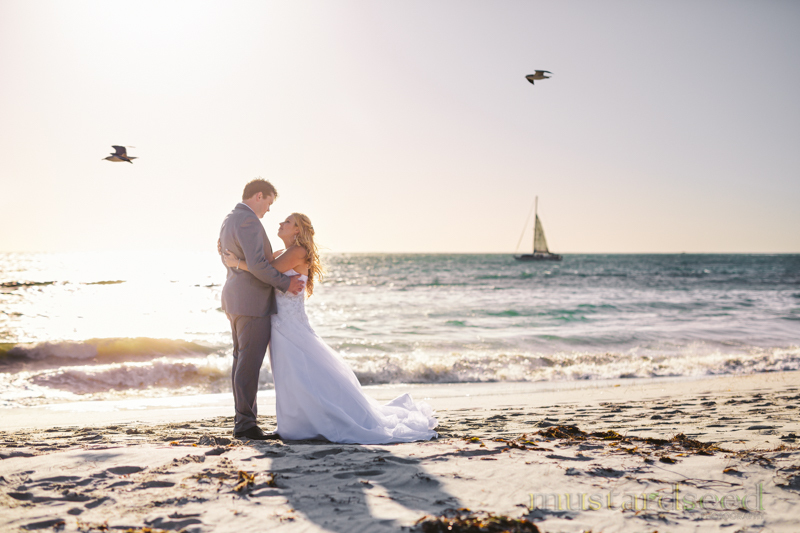 Bobbi and Andrew were so happy when the sun came out for their location shoot despite the rainy forecast on their wedding day! You don’t often get clouds like these, but when you do – jackpot! 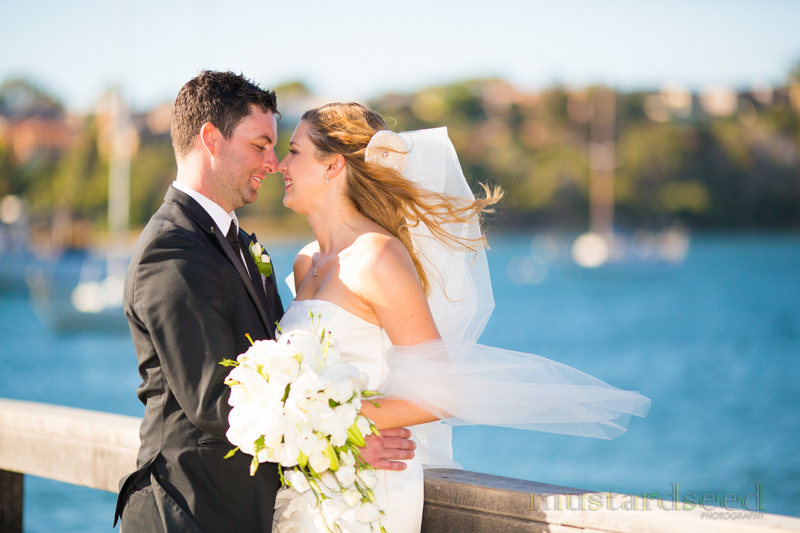 Simply breathtaking views here with Rachel and Andrew! 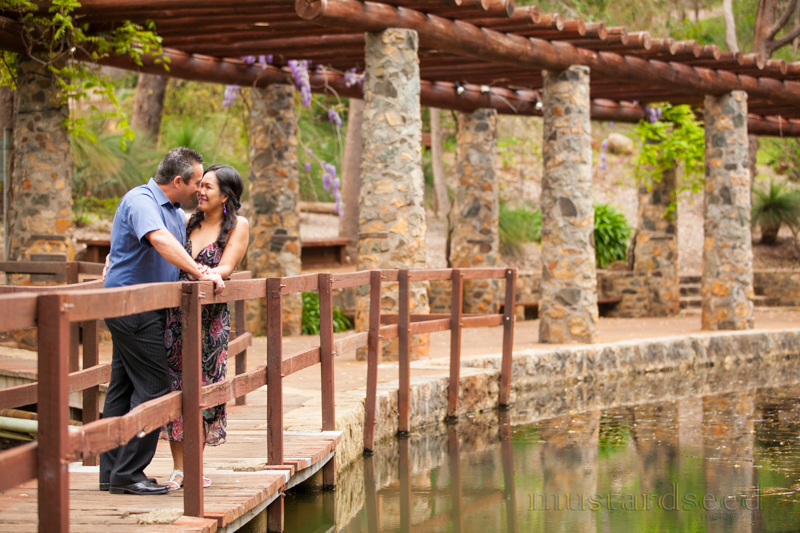 Love the earthy colours of Araluen, contraster by the rich vibrant colours of its flowers! 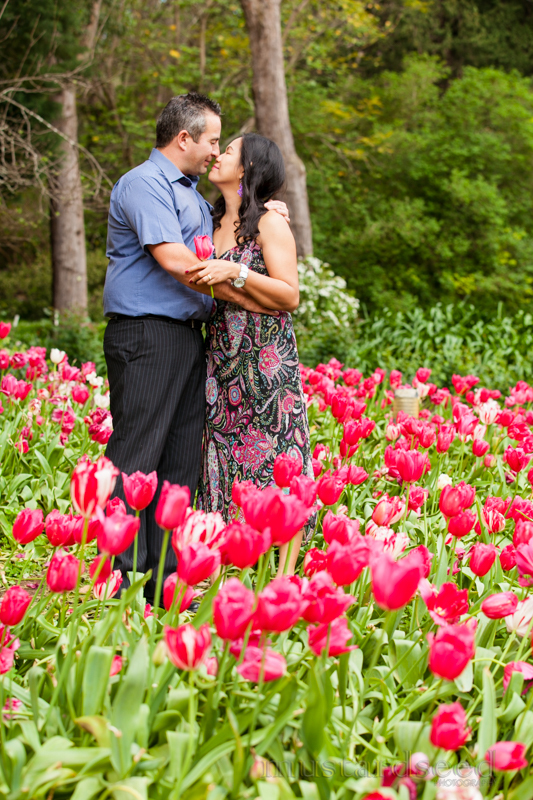 Photos amongst these beautiful red tulips is a must! Though more than 2 hours away from Perth, Nambung National Park is one of Western Australia’s most popular tourist destination. It is definitely one of a kind, and you’ll feel like you’re in a different planet when you visit! 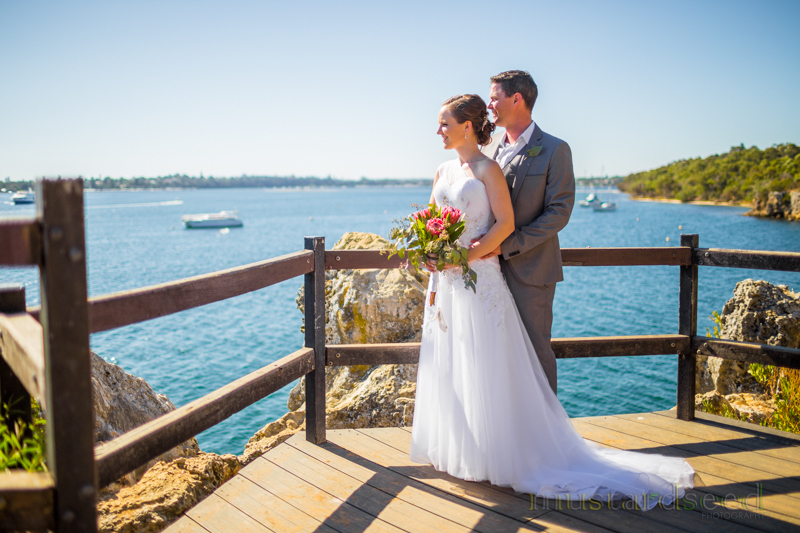 Jason and Shelley made sure the whole trip was worth their time so they prepared a few sets of wardrobe changes, and the resulting photos were stunning and looked like they were pulled straight out of a fashion magazine! 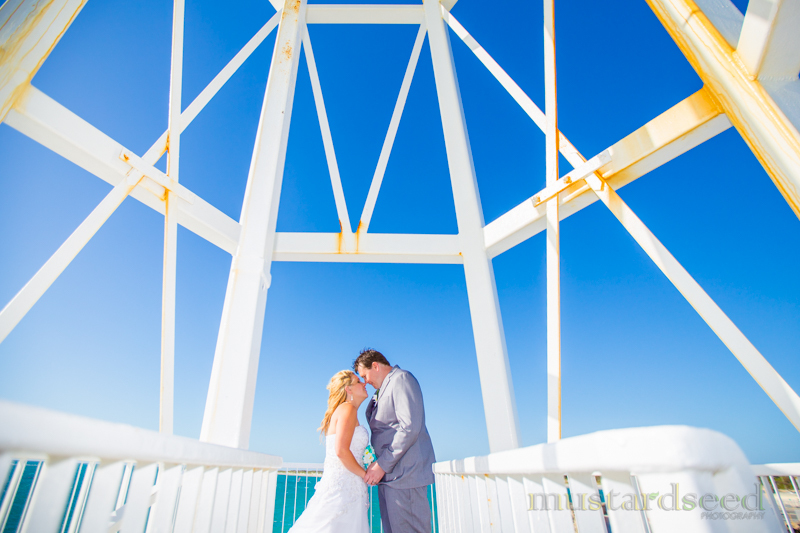 This tower at Hillarys gives you breathtaking views of the beach from up high. 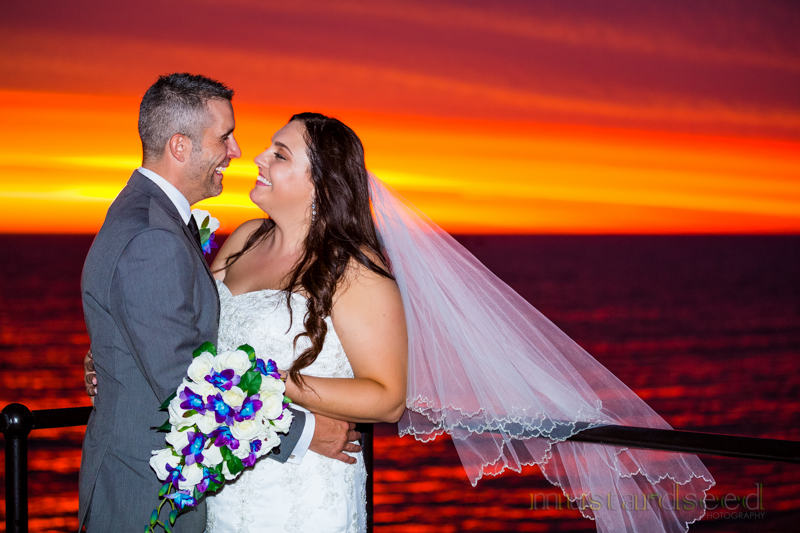 Love this photo of Adam and Stace when the sunset gave us very dark red and orange hues that made the sky and sea deep red! Talk about perfect timing when these seagulls got into my shot! 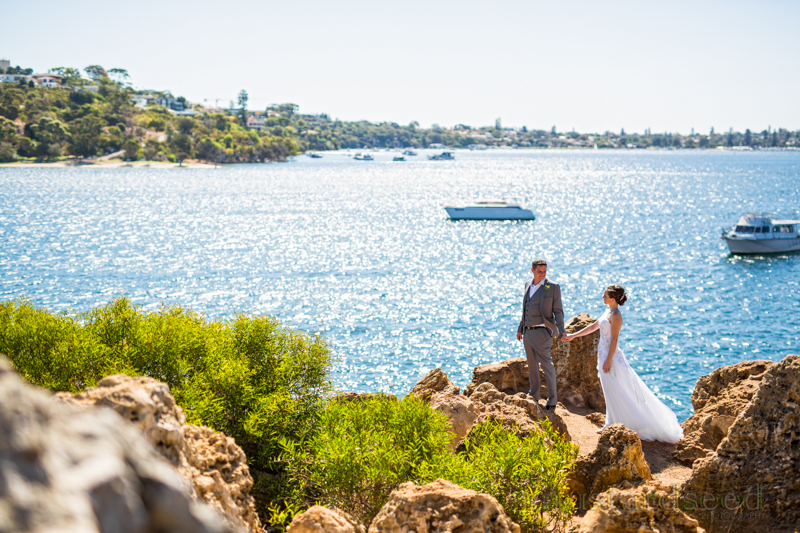 This spot probably has the best view in Iluka! 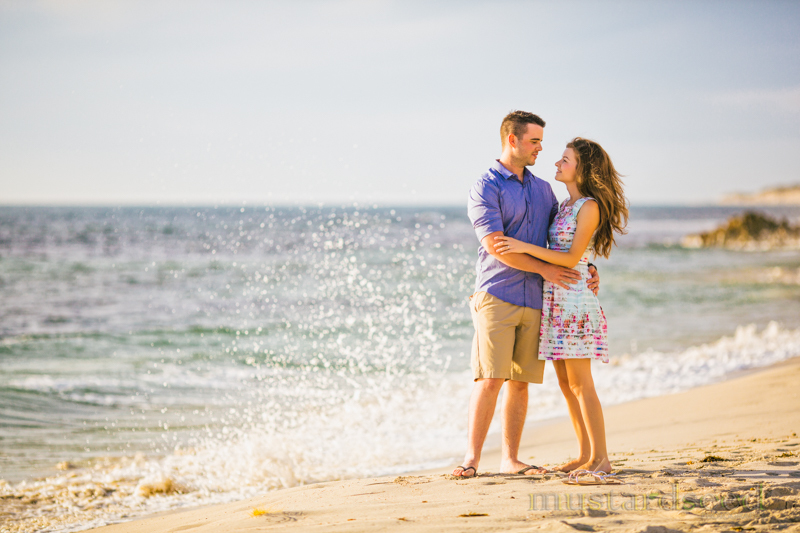 Katy and Matt enjoying the sea breeze and a few splashes! 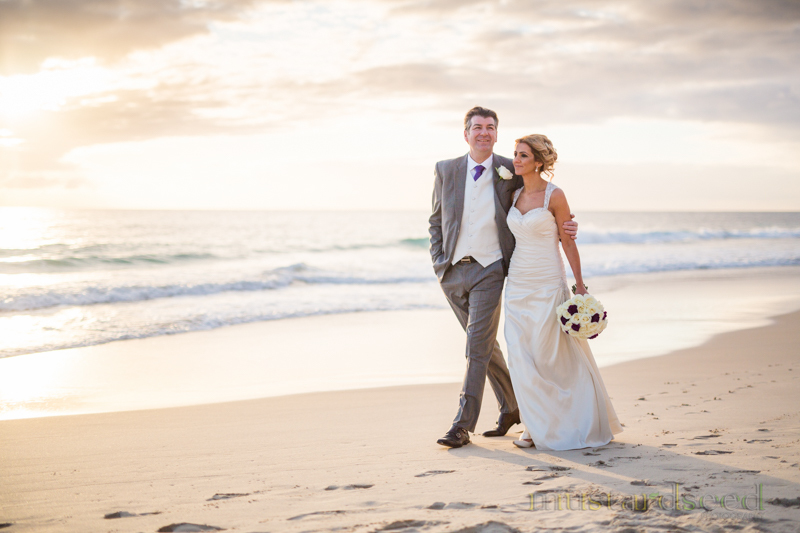 Thank God for a beautiful sunset on Joe and Sunny’s wedding day! 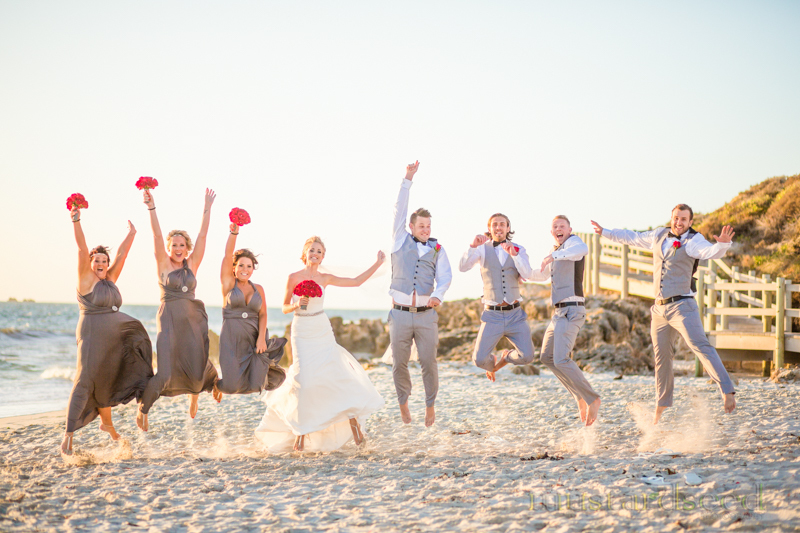 Jump shot! 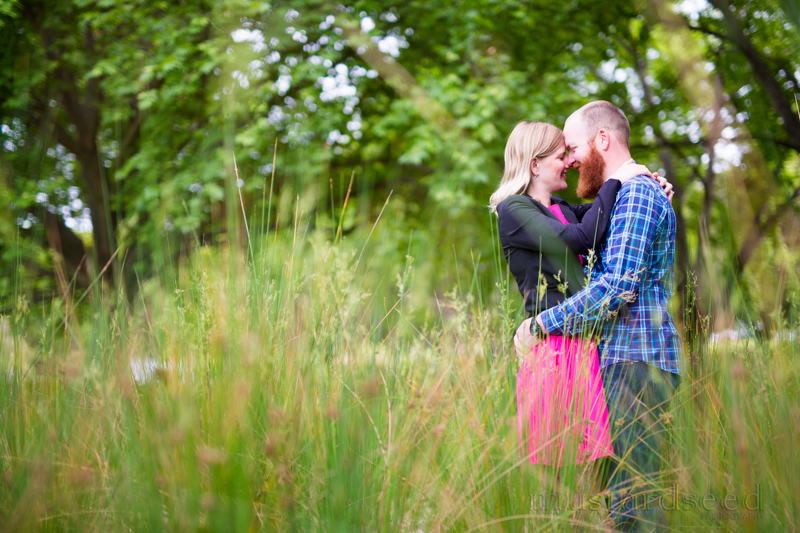 Loving the green hues standing out, and yes, check out that photo bomber on the left! 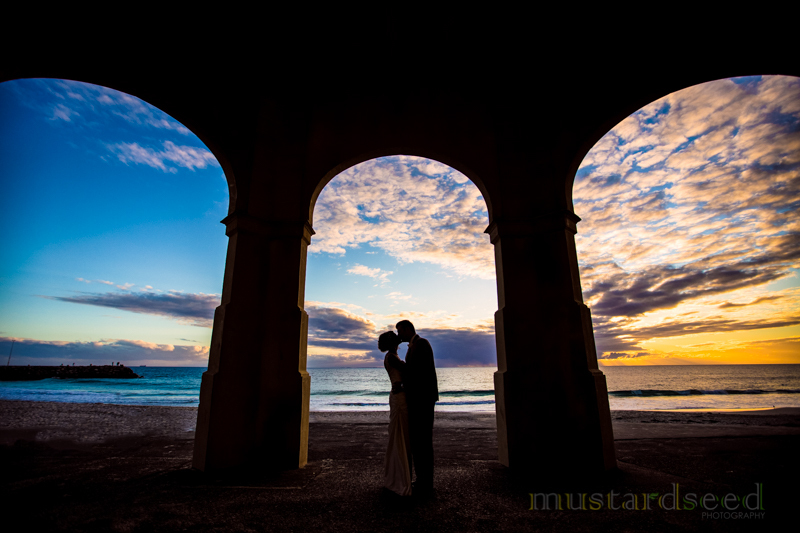 Sunset photos at City Beach just before your reception is definitely an option! 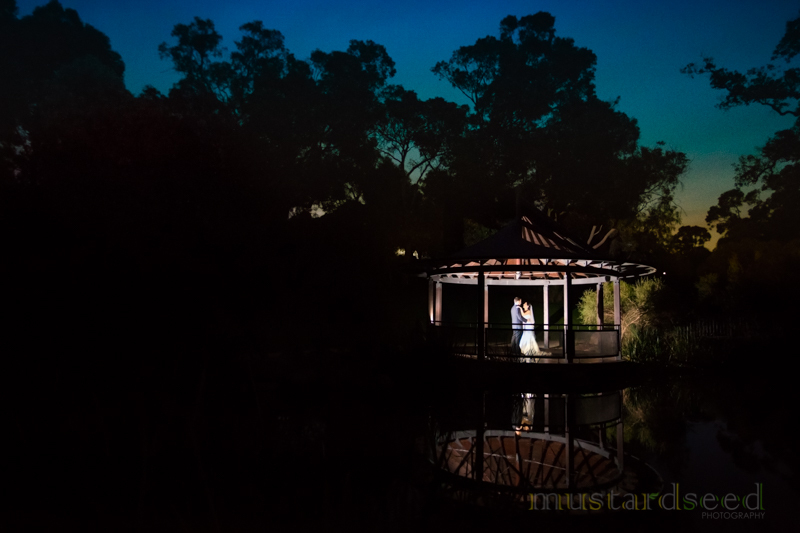 Love this night shot with Julie and Xavier, capturing their reflection on a water puddle which was caused by recent rain. I love experimenting and using my creativity to create photos like this which are one of a kind. 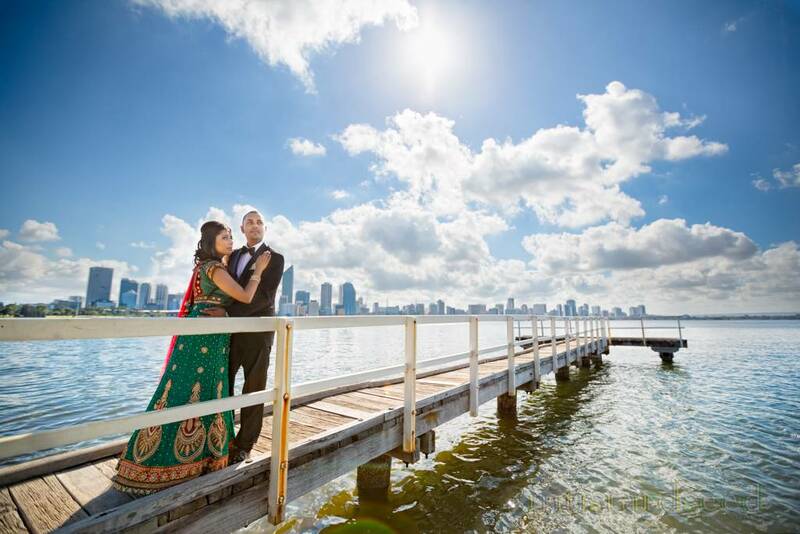 Neel and Chandni at one of South Perth’s jetties. The shores just below Heathcote Reserve also has nice views of the city skyline. 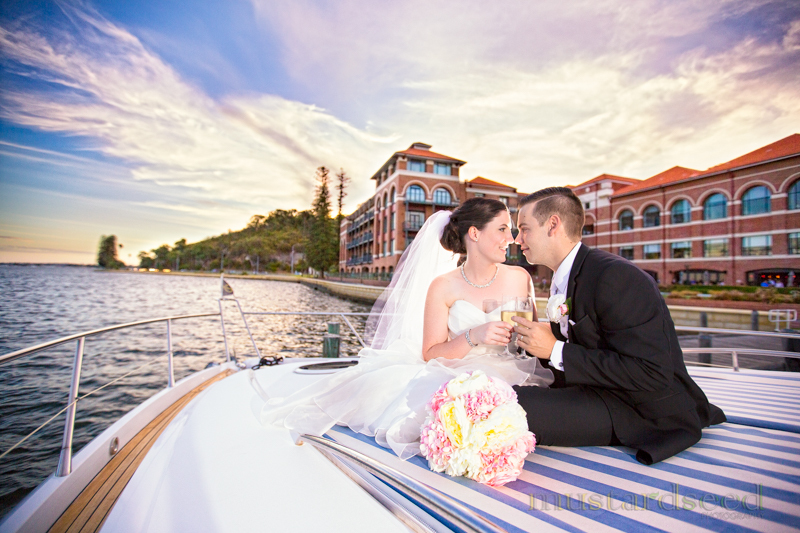 Brookleigh offers all-in-one packages where couples can spend the night here, have their ceremony, and then their reception. 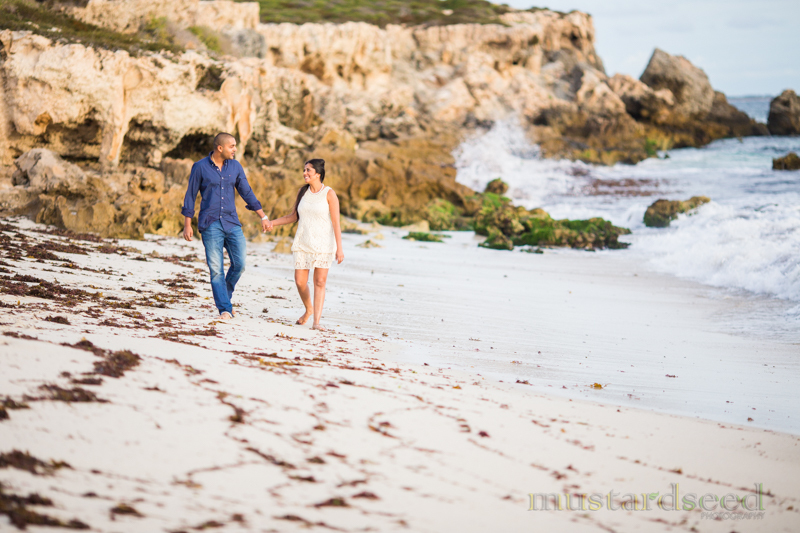 If you can have photos like Katy and Matt’s, it’s definitely worth considering having it all here! Taken inside one of the manors of Brookleigh, they offer spa services as well which is housed indoors in some of the many rooms within the manor. 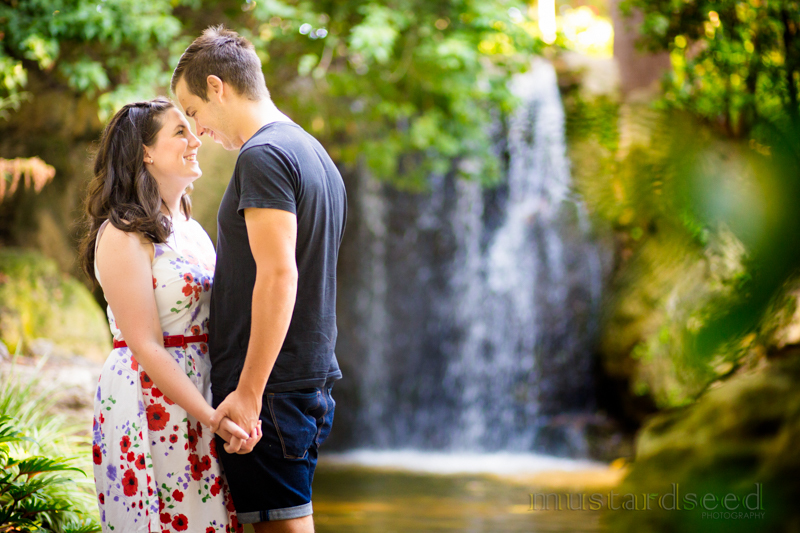 Ahhh… Caversham’s famous waterfalls! 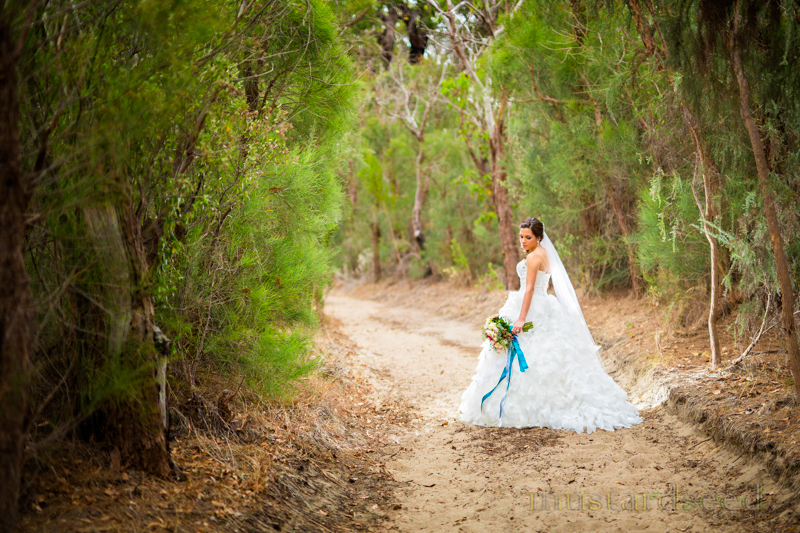 One of its unique features which makes it one of the most popular wedding destinations around the Swan area. Even the stairs look majestic! Who says you’re too old to go on a swing?? 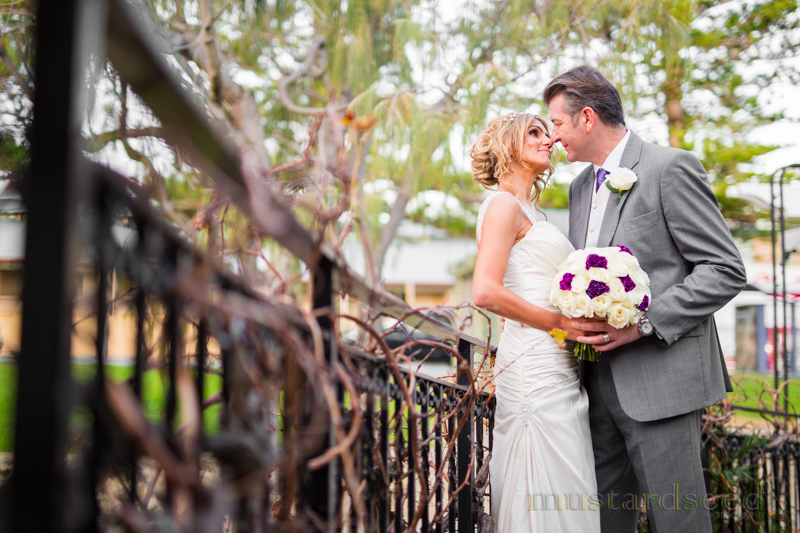 Mulberry on Swan has big landscapes, even big enough to have your limo park on the grounds. 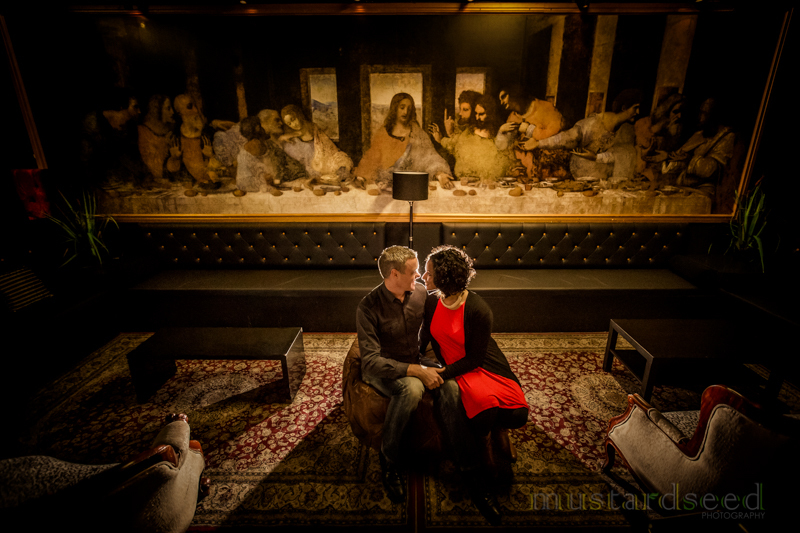 At one of the art galleries within the city, amazing artwork and stunning bride Liz! London Court which offers couples a taste of England! The curved walkways along the rivers make for great photos such as these. Lee and Selina taking Roxy for a stroll along the river where you could sometimes actually see dolphins swimming around! One of Lisa and Nigel’s dating spots, the Greens & Co Cafe features trendy decor and delicious coffee and desserts! A secret location we found while strolling along Leederville, even though they were still closed for business, we asked staff if we could take a few snaps, and they were okay with it. Sometimes all we need to do is ask! 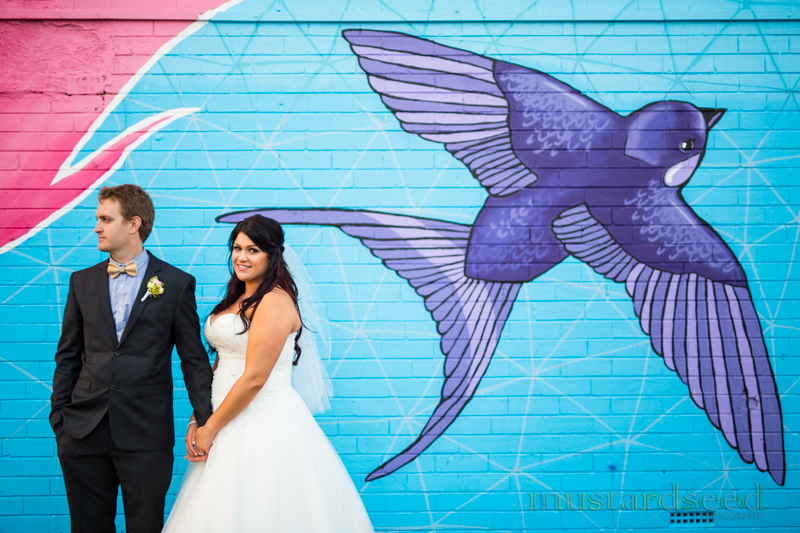 One of Leederville’s vibrant and colourful murals – a must have for your wedding photos! 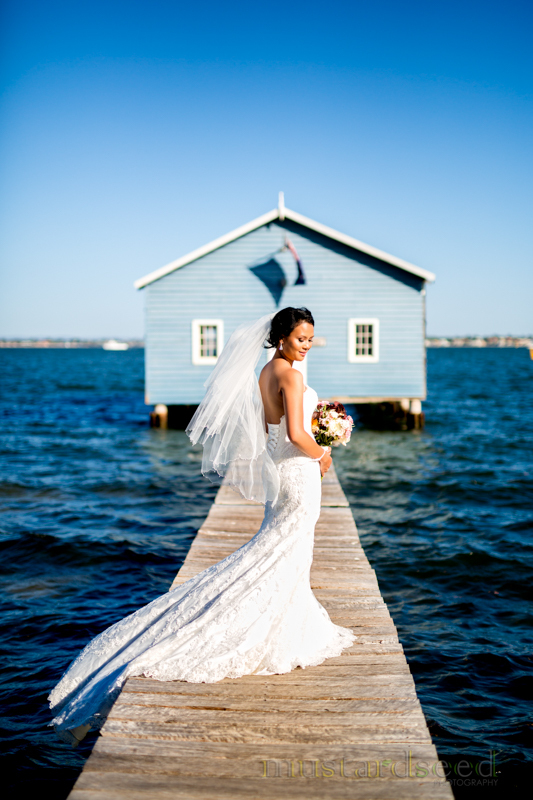 The blue boathouse is one of, if not the most, favourite wedding photography destination in Perth! 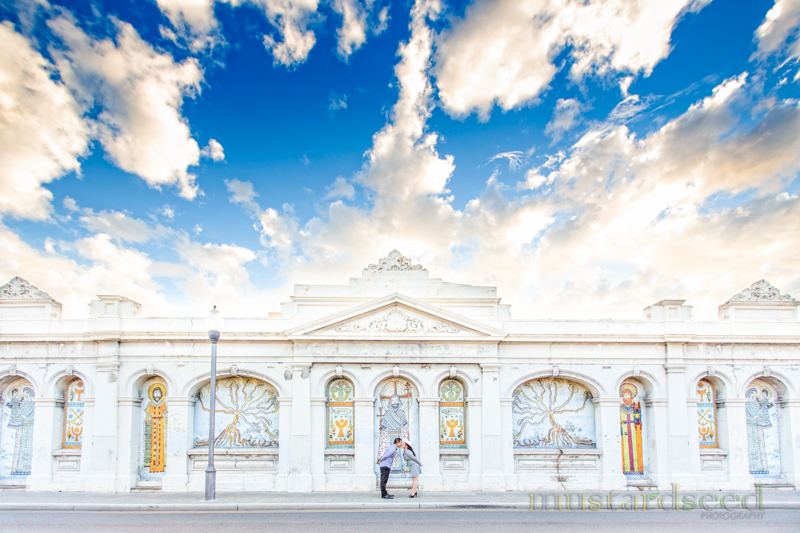 A jump shot with the Fremantle Roundhouse as the background, great job everyone! 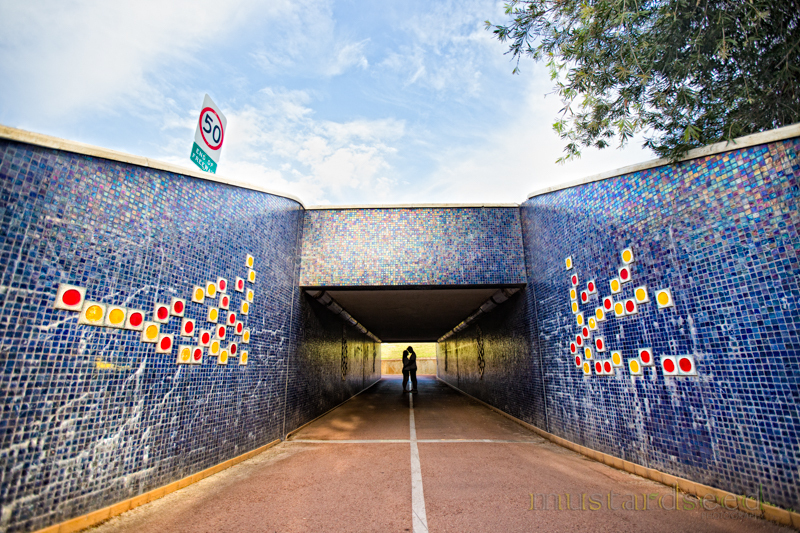 If you’re looking for art in simple, everyday things, you’ll find it here in Freo. 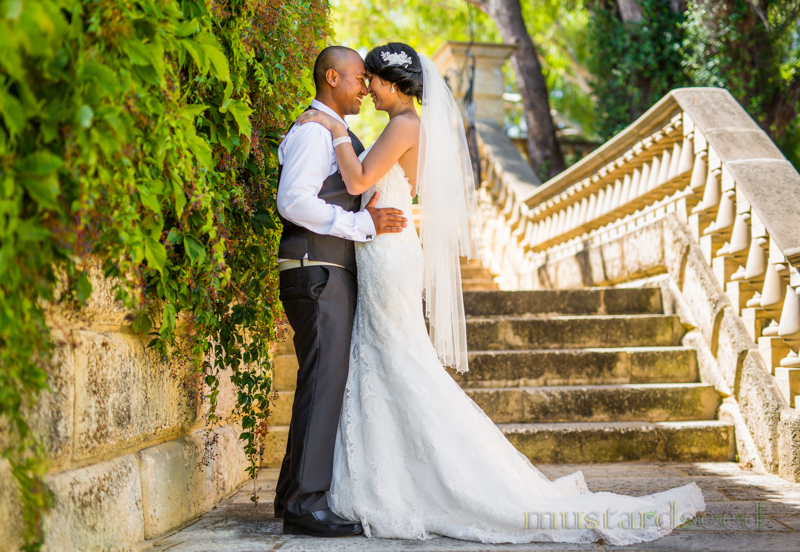 At UWA’s sunken garden where Julie and Richard got married. 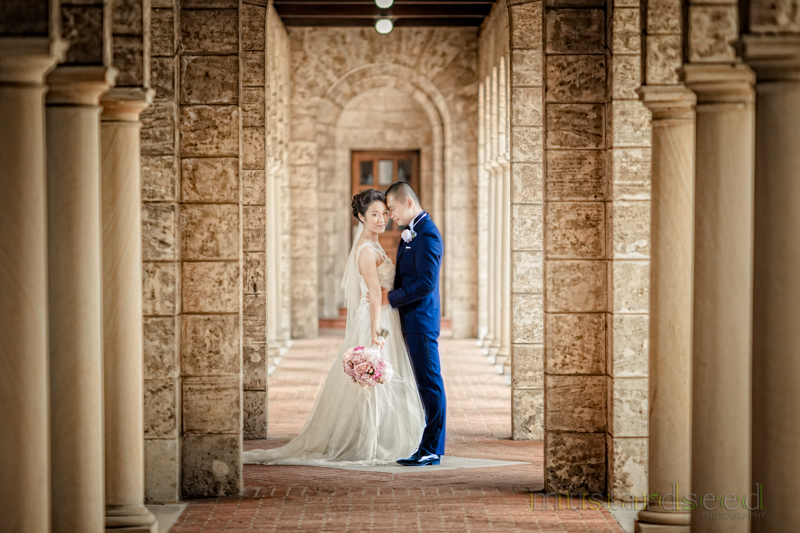 If you didn’t get married in UWA, you can still opt to pay them a photography fee, so that you can have your pre-wedding or wedding photos taken within the university’s premises. I saved the best for last! 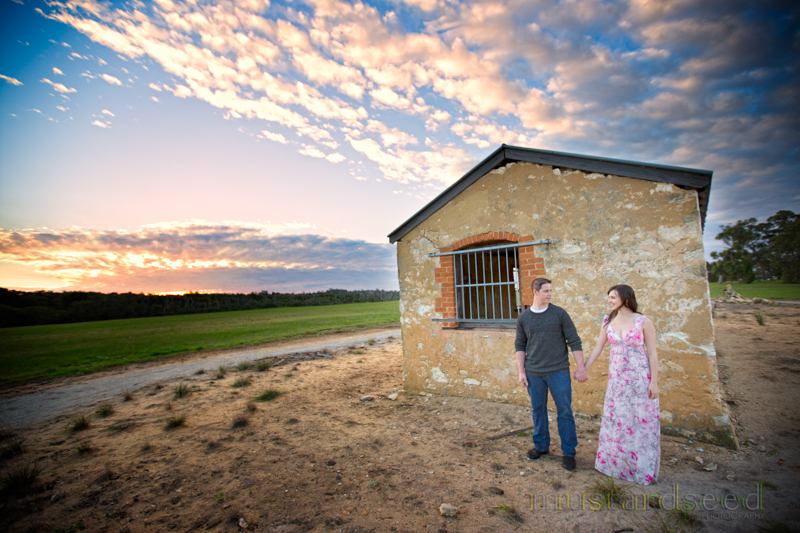 Of course, the best locations for your photos are those places that you as a couple hold dearest to your hearts. 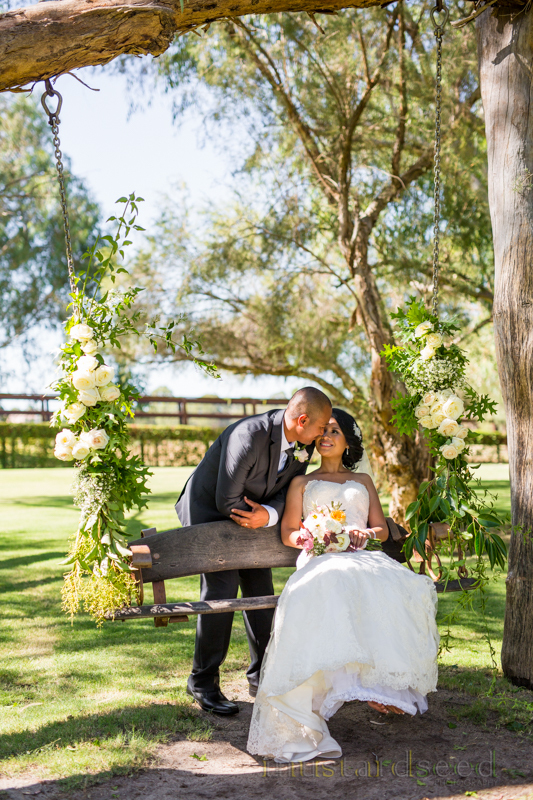 Here are some of the ones the couples themselves have chosen because these places remind them of a certain special moment in their lives before they got married. 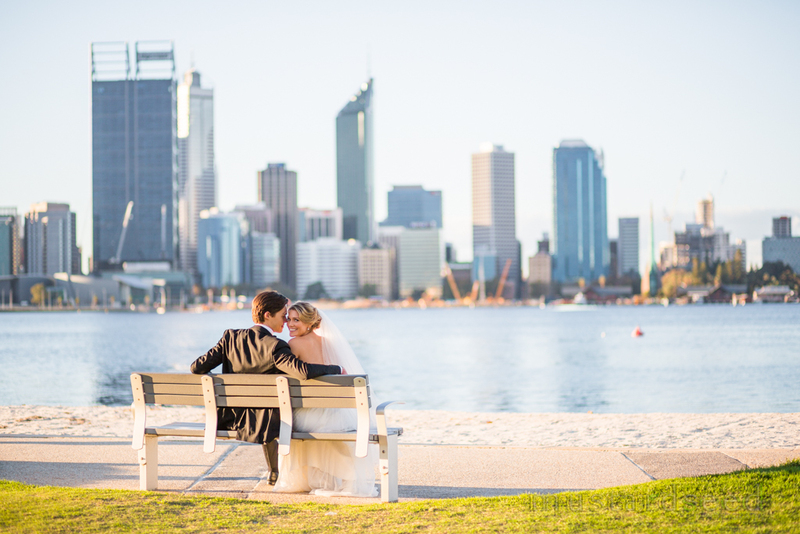 On their wedding day, Gemma and Tom went back to where Tom proposed to Gemma. I loved the purple and orange hues of the sunset on this night, breathtaking! Lisa and Nigel loves to cycle together, and what better way to remind them of this than to actually ride their bikes on their pre-wedding shoot! 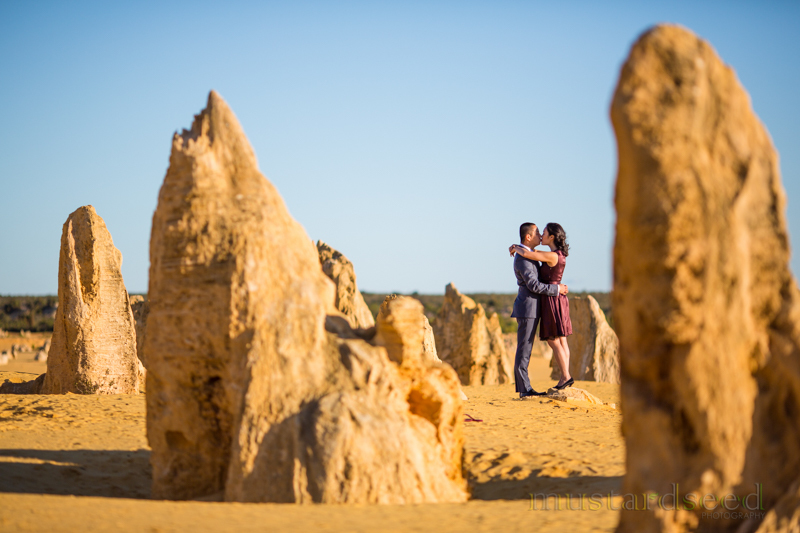 Megan surprised Richmond on the day of their pre-wedding shoot by re-enacting Richmond’s romantic proposal to her at Stingray Bay in Mandurah one year ago. Megan did an amazing job decorating the area surrounding the big tree with little candles. 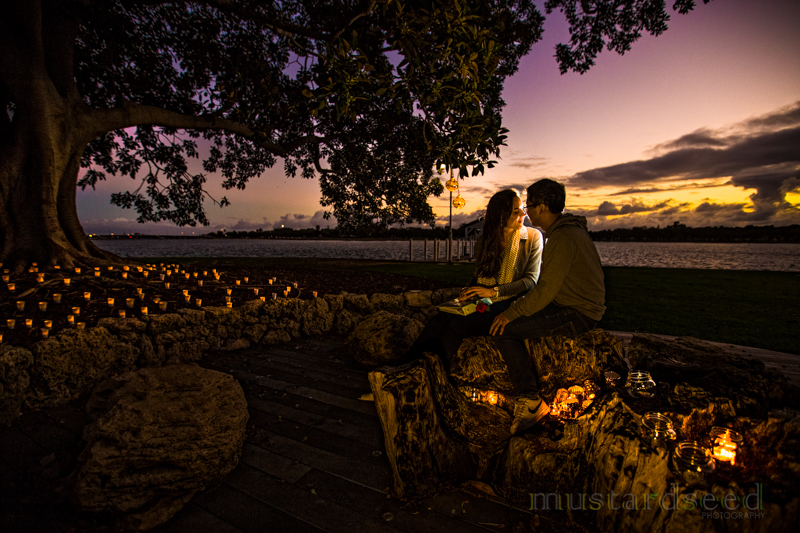 The result as you can see is like a scene from a romantic movie! 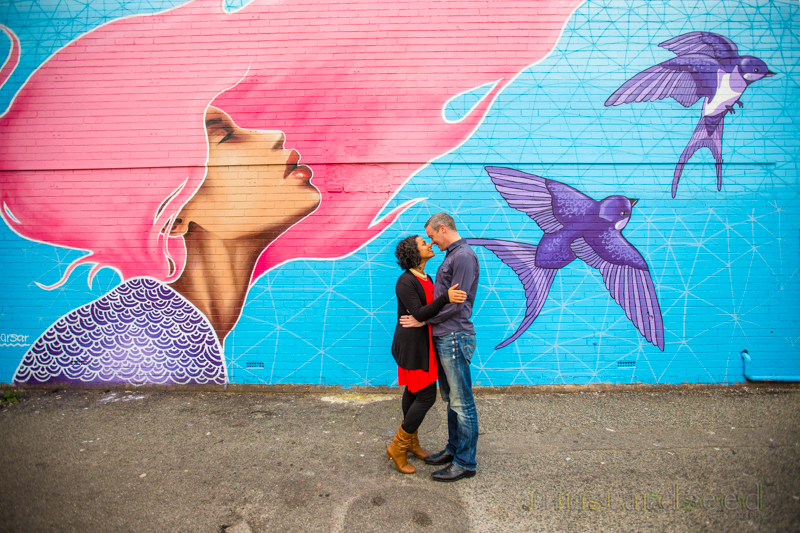 Jason and Shelley loves going out to eat and discovering new places to eat! 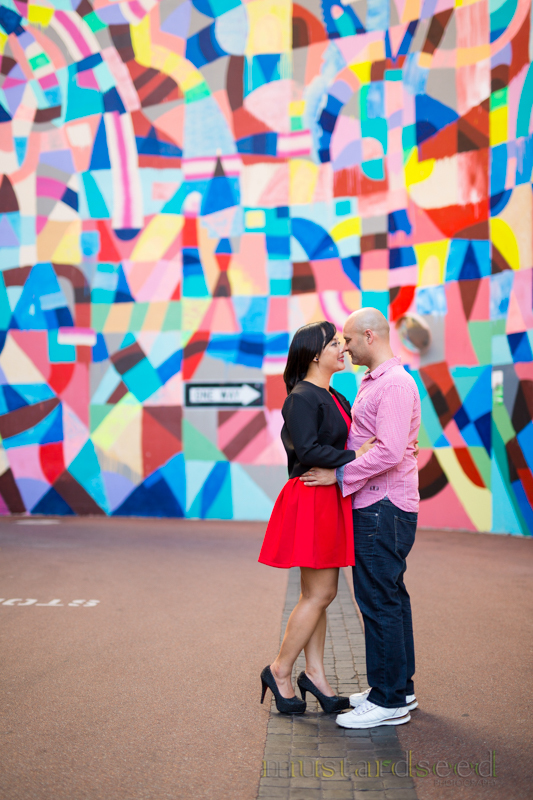 The love this quaint little place in Maylands called Sherbet Cafe, and for their pre-wedding shoot, they requested to come here and have their favourite desset – a Red Velvet cake, Yummm! One of the most special places I hold dear in my heart is my home in the Philippines. 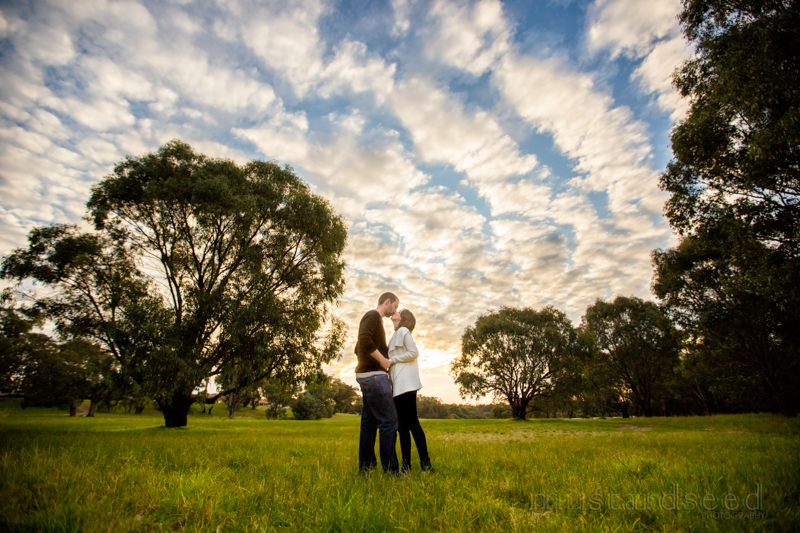 For Hayley, this holds true as well, as she picked their home in Willetton where she grew up as the location for her pre-wedding shoot with Daniel. 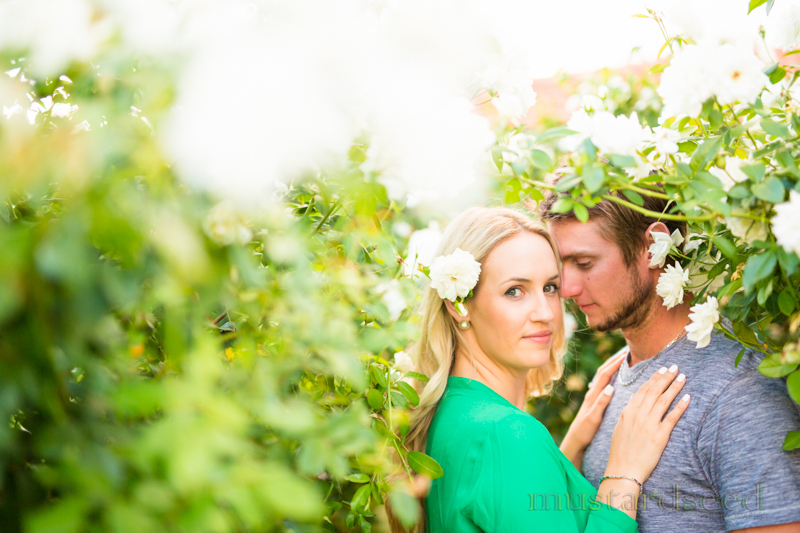 This is a photo of her parents’ rose garden, and how gorgeous it turned out to be!! 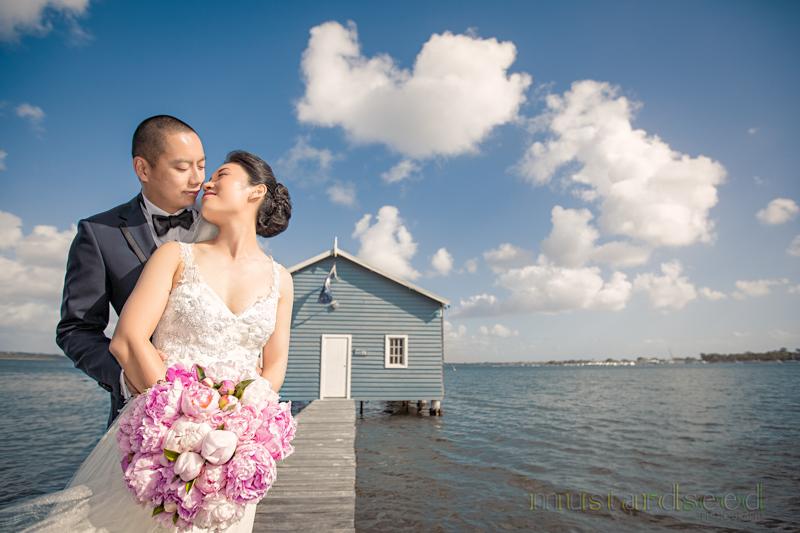 Mary and Sonang aren’t your average couple, they are avid fishers and would go far distances for good catches! (I was shocked when they showed me photos of the giant fish the’ve caught!) 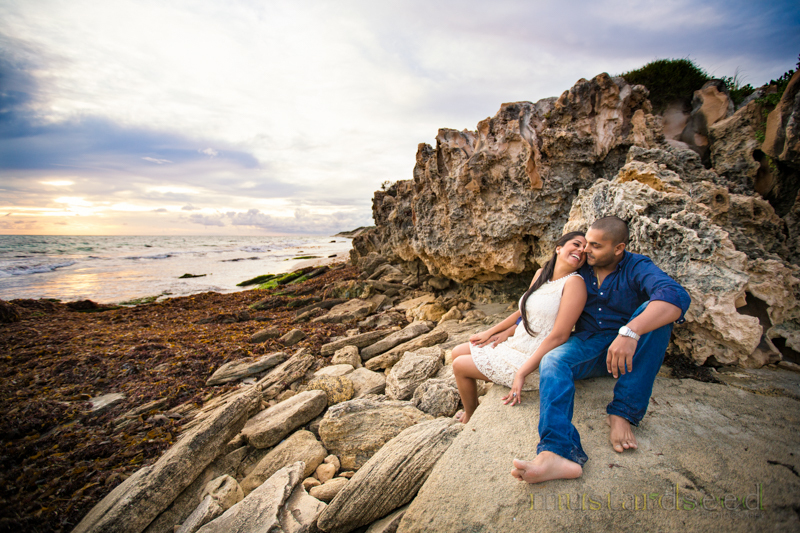 One of their favourite fishing spots is Woodman Point, and this was their first choice when it came to their pre-wedding shoot.